Foreign ministers before November end will agree on the outlines of the road map for the implementation of the Minsk agreements. Russia supported the creation of the armed OSCE mission in Donbass, President Petro Poroshenko told reporters after the "Norman Quartet" talks in Berlin Thursday, 20 October. According to the President, foreign ministers of Ukraine, Germany and France would approve before the end of November the design basis of the road map on the implementation of the Minsk agreements. "No documents were signed ... We focussed on the development of the road map," said the president. A good part of the discussions was dedicated to security issues: the withdrawal of troops and the unhindered access the OSCE, particularly to the border. The president said that Debaltsevo should be one of the four future areas of disengagement. The four leaders also discussed an unrestricted access of lawyers and representatives of the Red Cross to the hostages held by militants. The date of the elections in the temporarily occupied areas has not been discussed during the negotiations. "There is no alternative to the Normandy format at this stage. This was clearly stated during today's meeting," stressed the President. German Chancellor Angela Merkel, in turn, said that the Normandy Four summit has proved the importance of the resumption of the direct negotiations on the level of heads of state and governments with the participation of Vladimir Putin. In her words, although the day "has brought no miracles", a progress has been achieved regarding the "road map." Germany and France are ready to continue to contribute to the settlement of the conflict in eastern Ukraine, Merkel said as quoted by Deutsche Welle. Merkel also stressed the need for Ukraine to adopt a law on the elections in Donbass. On the security front, the talks focused on the disengagement of forces and the ceasefire. 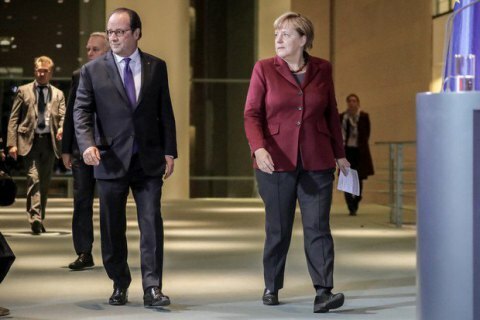 In general, Merkel was upbeat about the results of the Normandy Four meeting. Russian President Vladimir Putin said that the sides agreed to continue work on the disengagement of forces, as was done in Zolote and Petrivske. "We have confirmed that we will continue working together on the political track, including in terms of the final agreements on the procedure pf implementation and operationalization of the agreement on the special status in certain areas of Donetsk and Luhansk regions," Putin said as quoted by his press-service.